REDWOOD CITY, CA (June 27, 2018) —Over the last five years, CEO pay packages have steadily increased on average by approximately 4% each year. The mix of CEO compensation, especially equity, has seen updates to reflect the modern pay landscape, according to the most recent Equilar report, CEO Pay Trends, featuring independent commentary from Meridian Compensation Partners. CEO pay for Equilar 500 companies—a sample of the largest public companies as measured by revenue—increased 3.5% in 2017 to a median $11.9 million. 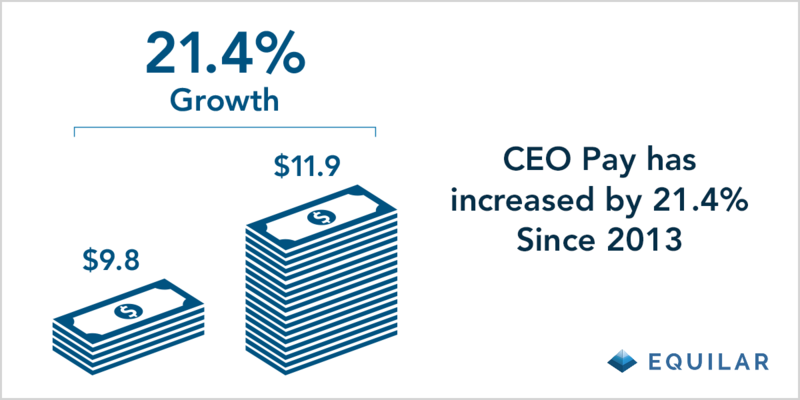 Overall, median CEO pay has increased 21.4% since 2013. Fiscal year 2017 also saw a greater shift away from time-based options. “In the five years included in the study, 2017 was the first and only year a majority of companies did not utilize time-based options as a long-term incentive (LTI) vehicle for CEO pay,” said Alex Knowlton, Equilar Senior Researcher and lead author of the report. While the prevalence of CEOs receiving time-based awards continues to decline, during the study period, a growing number of companies began granting performance-based LTI to their chief executives, reaching 86.5% of Equilar 500 companies in 2017. For further discussion and details on this topic, please join Equilar and Meridian Compensation Partners for a webinar on July 12. Registration is now open—visit www.equilar.com/webinars to learn more about this and other events. 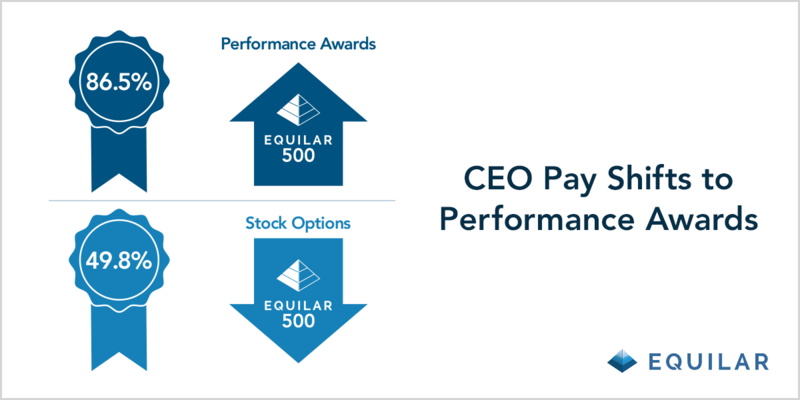 CEO Pay Trends, an Equilar publication, analyzes the compensation data of chief executive officers at Equilar 500 companies over the last five fiscal years. The Equilar 500 is comprised of the 500 largest, by reported revenue, U.S.-headquartered companies that trade on one of the major U.S. stock exchanges (Nasdaq, NYSE or NYSE American), with adjustments to compare to the sector mix of similar large-cap indices. Fiscal year one is defined by companies that filed their most recent proxy statement (DEF 14A or DEFC 14A) or compensation information in a 10-K amendment (10-K/A) between May 2, 2017 and May 1, 2018. Additionally, CEOs who did not serve in the position for a full fiscal year were excluded from the analysis. Equilar is the leading provider of board intelligence solutions. Companies of all sizes rely on Equilar for their most important boardroom decisions, including 70% of the Fortune 500 and institutional investors representing over $13 trillion in assets. Equilar offers data-driven solutions for board recruiting, executive compensation and shareholder engagement that bring together business leaders, institutional investors and advisors to drive exceptional results while ensuring sound corporate governance. The Equilar suite of solutions includes industry-leading board education symposiums, comprehensive custom research services and award-winning thought leadership. Founded in 2000, Equilar is cited regularly by Associated Press, Bloomberg, CNBC, The New York Times, The Wall Street Journal and other leading media outlets. Visit www.equilar.com to learn more.